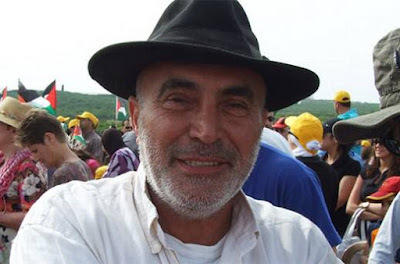 The New York Times does a story on the arrest of Ezra Nawi for turning a 'Palestinian' land seller over to the tender mercies of the 'Palestinian security forces' and manages to turn it into an indictment of free speech in Israel. Ezra Nawi, an Israeli Jewish plumber, has a long history as a left-wing activist helping Palestinians in their struggle against Israel’s occupation of the West Bank. Now he is under arrest in Israel, after a right-wing activist surreptitiously filmed him bragging about exposing Arab brokers who tried to sell Palestinian land to Jewish settlers. Such sales are a capital crime under Palestinian law. Considered variously as a big-mouthed provocateur and a colorful human-rights adventurer, Mr. Nawi has become the latest symbol in the battle between advocacy groups on opposite sides of Israel’s political spectrum, and the increasingly fierce debate here over the nature of Israeli society and democracy. The debate has heated up as Israel’s conservative government is pushing forward contentious legislation that would require nongovernmental organizations to disclose funding they receive from foreign governments in their publications, advertising and meetings with public officials. The proposed bill, which supporters say is meant to increase transparency, would apply mainly to leftist groups critical of Israel’s policy toward the Palestinians, since rightist groups mostly receive private funding from abroad, and it has already drawn harsh criticism from the Obama administration and European diplomats. No, this story is not about the NGO law, which the Times so hates. It's about yet another Leftist fascist who thinks he has the right to endanger other people's lives. It is an odd case. Mr. Nawi, described in a 2009 New York Times profile as “the Robin Hood of the South Hebron Hills,” helping Palestinians who love him and “thwarting settlers and soldiers who view him with contempt,” is now accused of endangering the lives of Palestinians. That is because selling land to Israeli Jews is punishable by death according to the Palestinian Authority. Although the authority is not known to have carried out any executions for any offense in more than a decade, there have been reports of torture in its prisons. The Ad Kan video, from about a year ago, shows Mr. Nawi behind the wheel of his jeep, bragging about what appeared to be a dubious sideline to his activist work in the West Bank. He told the man sitting next to him, whom he believed to be a fellow sympathizer, that he sometimes posed as a land broker and engaged with other land dealers mediating sales of Palestinian-owned land to Jewish settlers, then handed over their details to the Palestinian Authority security services. Days later, he was arrested at the airport as he was about to leave the country. Odd? Not to anyone who knows the history of Israel's prosecutorial regime burying charges against the Left. Only by gathering evidence so convincing that even the Left-leaning Uvda had to run with it or lose all credibility could Nawi's disgusting behavior be exposed. There is a story here. Too bad it's not the one the Times chose to tell.